By the Booklet. Booklet makers ensure efficiency, productivity..
Booklet maker manufacturers target the needs of the growing digital, print on demand market, increasing productivity through automation and higher page capacity. These devices deliver polished results with additional options for stitching, folding, and specialty spines. Mid- to high-volume booklet makers handle jobs of up to 200 pages. Speeds range from 1,700 to 6,000 booklets per hour. In addition to automation, optional features and add-on tools further reduce touch points and enhance efficiency. The demand for booklet applications comes from a variety of sectors, including education, financial services, government, and healthcare. Applications range from magazines and calendars to manuals, pamphlets, reports, catalogues, and testing materials. The latest advancements in booklet making equipment entice digital users and are designed to streamline the process. Some of the latest innovations include automated sheet feeders, targeted software, higher page capacities, and square spine solutions. These features attract new users and expand application potential. Booklet makers bind pages with wire-fed stitching or stapling and include an integrated folding or creasing option. In digital printing environments, booklet makers are generally fed with an automatic sheet feeder, though some devices are hand- or collator-fed. Available in nearline and inline configurations, automated sheet feeders reduce touch points and increase productivity. Many functions reduce or remove manual steps to keep up with digital print volumes. Other options include automated cutting and slitting and high-capacity book stackers. “By automating the booklet making process, operators spend less time setting up and more time running jobs, resulting in increased productivity as well as faster turnaround times,” says Anthony Gandara, product manager, Duplo USA Corporation. Many booklet makers include targeted software that allow operators to easily manage the system, automate workflow, and ensure job storage. Software also enables integration with the printer, and for some systems, multiple print sources. Intelligent feeding provides custom features that support both digital and offset printed media in one system. To serve digital printers handling variable jobs, barcode reading options are also available. Although page count is sometimes a limiting factor for booklet makers, today many handle higher page capacities to enable a broader variety of applications. They also support more paper types, sheet sizes, and quantities. While magazines, calendars, and brochures are popular applications, uses extend to CD booklets and manuals to newsletters and reports for workshops, seminars, and trade shows. “A booklet maker is an ideal choice for copy and print shops, in-plants, small offices, and any organization with a need to produce high-quality booklets quickly and efficiently,” observes Carrie Ford, art director, MBM Corporation. Booklet makers produce professional products with a smooth, lay-flat style. By providing more stitching types and folding variations, booklet makers also expand the output range to include rate sheets, memos, binder inserts, and direct mail pieces, notes Neal Swanson, director, marketing communications, Standard Finishing Systems. Some offer a square spine solution to expand capacity, allowing booklet makers to compete with other binding systems. These devices offer the square-spined appearance that some buyers require, with the longevity that stitching provides and the efficiency of a booklet maker. “Some people favor perfect binding because the books have a square spine that can carry print—but even that is possible with some booklet makers,” explains Paul Attew, sales director, Watkiss Automation Ltd. 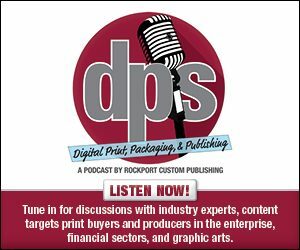 Here we highlight booklet makers targeting mid- and high-volume digital print environments, including stand-alone devices and systems that work inline with a feeder, a compatible print engine, or both. C.P. Bourg offers a range of booklet makers, including several with inline bleed trimming and sheet-creasing features, JDF/XML automation, and touchscreen controls. “Considering the printing industry’s massive shift from lithography to inkjet and digital, our solutions allow customers to bring stacks of pre-collated work from any of their printing processes, load it as pre-collated stacks, and finish it into booklets with limited operator intervention,” notes Tressler. The company also distributes the PowerSquare 224, manufactured by Watkiss. Its BME Booklet Maker finishes sheets from 4.6×2.75 to 14.5×23.5 inches. Available in several configurations, it utilizes a stitch-fold-trim process. It produces booklets up to 120 pages—30 sheets—at up to 5,000 booklets per hour. The BME Booklet Maker offers automated setup and a color touchscreen interface. Its paper path follows a right-to-left process to work inline with Hewlett-Packard Indigo presses, or a left-to-right path to work inline with Xerox printers. C.P. Bourg also offers the Bourg Sheet Feeder (BSF), an automated sheet feeder that allows multiple printers or presses to share one finishing device. When configured inline, its dual mode enables shifting or merging job production, including between digital and offset. Another booklet device, the BME-ExPress with BSF, is an inline system designed for the HP Indigo 5500, 5600, and 7000 Series digital presses. It utilizes C.P. Bourg’s automated feeder to ensure greater efficiency in digital on demand and Web to print environments. Duplo offers entry, mid-, and high-volume devices that convert media from multiple print sources into booklets. Available features include intelligent feeding, two-knife trimming for full-bleed booklets, barcode reading, and specialized cutting and creasing tools. PC-based software allows easy management of the booklet system. “Users can save an unlimited number of jobs within the memory of the PC to later recall and use to change from one job to another within a matter of seconds without any tools or manual intervention required,” adds Gandara. For medium production runs, options include the 350 Digital Booklet System and the 350C Booklet System, which both produce booklets up to 80 pages. The 350 series converts digital pre-collated printed media into saddle-, side-, and corner-stitched booklets. It processes up to 2,400 sets per hour with an estimated monthly volume of 280,000. It utilizes the DSF-2200 Sheet Feeder and PC-based software to achieve fast, touch-free changeover between jobs. The 350C series converts un-collated digital or offset printed media from multiple sources into saddle-, side-, and corner-stapled booklets. It utilizes a suction-feed collator to feed the paper and produces up to 3,000 sets per hour with an estimated 300,000 monthly volume. Connected collators increase loading capacity and improve efficiency. Duplo’s 600 Digital Booklet System is one of the company’s high-production options. Like the 350 digital series, it creates saddle-, side-, and corner-stitched booklets and utilizes a sheet feeder for automation. It produces up to 3,200 sets per hour, with an estimated monthly volume of 400,000. The device’s Hohner stitch heads enable saddle stitching up to 120-page booklets, corner stitching up to 60-page booklets, and side stitching up to 100 pages. Another high-volume option is the iSaddle Digital Booklet System, which converts pre-collated digital printed media into saddle-stitched booklets. Its Hohner stitch heads create booklets up to 120 pages in a variety of sizes and formats—including CD-size, calendars, and letter landscape. The software-driven system features a two-tray sheet feeder. It produces up to 3,200 sets per hour, with a monthly volume estimate of 300,000. MBM’s StitchFold booklet maker utilizes a wire-fed stitching and folding system. “The stitching system replaces costly staple sticks with economical spools of wire, saving money while reducing downtime—no more stopping mid-run to replace staple cartridges,” says Ford. The magnetic stitching heads feature one-step threading for easy setup. The StitchFold processes 2,300 booklets per hour and up to 65,000 booklets before the wire spools must be replaced. It runs inline with a variety of collators and produces booklets up to 100 pages. A staple leg adjustment feature allows staple lengths to be custom fit to the size of the booklet. An optional trimmer is available. The powered exit conveyor stacks booklets neatly after they exit the booklet device or the trimmer. Plockmatic’s booklet makers utilize a stapler apparatus. Many are compatible with key print engines. “JDF-based automation is offered on an increasing number of our systems to eliminate manual steps and reduce errors,” notes Scott Russell, VP, inline and mailing business unit, Plockmatic. The MX-BM50 is Sharp-compatible or configurable for offline manual feeding. It creates 140-page booklets, up to 30,000 per month. Optional features include a face trim module and a book fold module, which creates a square folded edge and printable spine, mimicking the look of a perfect bound book. The Pro50 and Pro35, which create 200- and 140-page booklets, respectively, are compatible with Xerox presses and offer bleed trim, sheet rotation, and crease modules. Other options include the face trim module and a square folding module. Pro50 and Pro35 produce 30,000 booklets per month. Plockmatic’s PBM500, PBM350, and 5010e devices are compatible with Ricoh printers and also configurable for offline sheet or manual feeding. They offer software integration and modules are available for bleed trim, sheet rotation, crease, and face trim, as well as a book fold feature. The PBM family produces up to 30,000 booklets per month, with booklets of 200 pages for the 500 model and 140 pages for the 350 model. The 5010e creates up to 20,000 120-page booklets per month. Standard Finishing Systems’ Horizon SPF/FC-200A/L offers stitching and folding with face trim. A color touch screen handles advanced setup automation, including folder roller gap settings and centralized control. Stepper motors drive stitching heads, end stops, side guides, and other systems to the exact location for the job’s sheet size and finish style. An integrated hand-marry station increases flexibility. The device also features a built-in error eject tray that enables non-stop production at up to 4,500 booklets per hour. Connected with the Standard Horizon HOF-400 High-Speed Sheet Feeder, it offers variable page count production. The HOF-400 feeder is configurable to run inline with Horizon booklet makers and saddle stitchers. It feeds up to 45,000 8.5×11-inch sheets per hour, and handles sheets up to 14×24 inches. It delivers variable page count production with integrity and verification using a standard mark reader, which easily shifts from top and bottom reading for different applications. It also accommodates cover feeding, accumulating, and manual feeding depending on the job requirements. As an offline feeder, the HOF-400 provides flexible system configurations including sheet insert on, variable page count, bleed trimming, and creasing for digital printing. It also connects with finishing devices for use with both digital and offset output. The Watkiss PowerSquare 224 booklet maker combines stitching, folding, spine forming, and trimming to produce square-spined books up to 224 pages. “They offer a professional high-quality appearance and books that open flat without damaging the spine. The book can carry print on the spine, giving the appearance of perfect binding with the security of a stitched spine,” explains Attew. The PowerSquare is configurable offline for hand feeding, nearline with a high-capacity dual-tray sheet feeder, or inline for a variety of leading print engines. Inline, it offers automatic sheet rotation. Options include a high-capacity book stacker for unattended operation during long runs and a two-knife trimmer to produce full-bleed printed booklets in a single pass. The system creates books that are 10.4 millimeters thick, enabling applications with thicker stock or higher page count. The PowerSquare forms the square spine during the folding process—not after, eliminating the need for pre-creasing. Offering an alternative to perfect or tape binding, it also enables two- and three-up books. Booklets are used in a variety of industries and environments. Booklet makers target these applications with automated tools and software that help ensure return on investment.